Flashlights are a common tool found in homes, but they’re often forgotten and shine best when a power outage occurs. While your typical discount store flashlights will work just fine, there are many more suitable flashlights that can go above and beyond, for situations such as jungle-trekking. 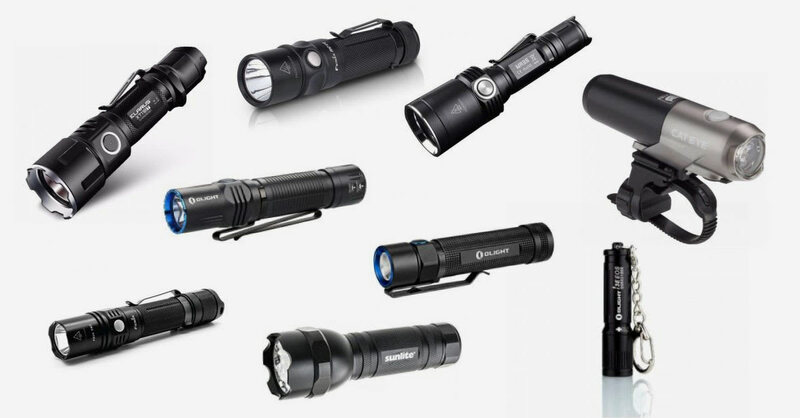 Here’s a list of flashlights to keep your eyes on. If you’re a Tomb Raider kind of person, the Klarus XT11GT might just be your needed trusty companion. It’s absurdly compact and lightweight, making it the essential portable light source that you keep by your side. Klarus’ LED portable light is insanely powerful; shining 2000 lumens light that has a beam distance of 316 metres! The Fenix PD35 is small enough to fit in your pocket and despite its mini size, it can beam out a 1000-lumen light beam that can reach up to a staggering distance of 200m. It’s also waterproof and built like a tank, evident by its body that has a Premium Type III hard-anodized anti-abrasive finish. Fenix has really outdone themselves with the Fenix RC11; it has a battery that can run up to 135 hours and best of all, it’s rechargeable. Being eco-friendly and long-lasting aren’t the only ‘wow’ factors; it can also be used as an upward-facing searchlight – thanks to its flat tail cap which allows it to stand. Bring out the warrior in you with the Olight M2R Warrior. The Olight M2R is a tactical flashlight that’s fit for the military, resisting wear and tear with its Type III anodised aluminium body. The body is strong enough for you to use it as a miniature self-defence weapon too. It also has a maximum output of 1,500 lumens – super-bright! Another product from Olight has made the list – the Olight I3E EOS Black. The Olight I3E is so tiny that you can hold the entire torchlight with just 2 fingers. It features a key ring on the tail cap which can be connected to a keychain. Pretty nifty, huh? That’s not all, it also has a scratch-resistant body, so a little ruggedness won’t hurt it! The Sunlite 51003-SU Flashlight is a flashlight that uses 3 AAA batteries. So, by putting in 3 AAA batteries, you’ll get a reliable red laser which can reach a distance of 411 metres. This flashlight also has 4 modes – white LED mode, green LED mode, red laser and white LED with strobe flashing (a.k.a blinking). The Olight S2R Baton is a super flashlight that’s designed for outdoors. It packs 3200 mAh batteries that have a max runtime of 60 days and is rechargeable through a portable magnetic USB charging cable. It’s ideal for many outdoor activities, as it is both waterproof and impact-resistant from up to 1.5 metres. The Fitorch MR35 XP-L2 is a one-of-a-kind torch. It comes with 5 different chips that can change the light’s colour. The 5 LED chips are: red, green, blue, UV and white. The blue and UV chips are especially useful for hunting as they help you to track wounded animals at night (they illuminate blood well). Cycle around town at night safely with the Cateye Volt 300. Not only can it be mounted on or under the handlebars of your bicycle, you can also mount it on your bicycle helmet, it’s that versatile. With 300 lumens, it’s bright enough to light your favourite bike route.